It is great to see that people realize how dangerous sugar is for our body but it is close to impossible to know how much sugar is present in many foods that we are already used to. A huge problem for many is that they do not actually realize the fact that a lot of sugar is present in what is eaten. Sugar has a really bad effect on the human body when consumed quantities are too high. Sugar was connected with numerous problems, like weight gain, acne and heart disease. You want to be sure that you are as informed as possible and that you know exactly what you are putting inside your body. After all, we are what we eat. 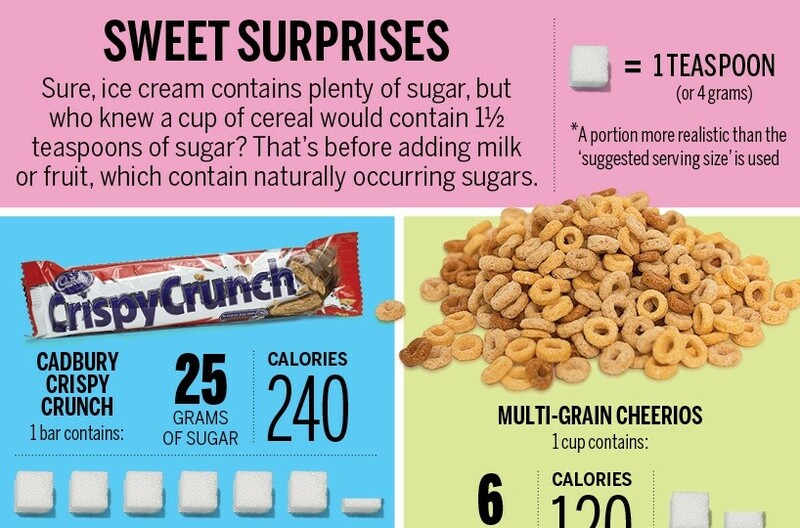 The infographic that you see below, entitled “Sweet Surprises”, helps you to learn what you could avoid. The useful information that you find is numerous, even starting from the first line, telling you exactly how much sugar you have in just one cup of regular cereal, around 1 and a half teaspoons. If you take a look at the infographic here you can see how much sugar you can find in Crispy Crunch, Multi-Grain Cheerios, Kraft Salad Dressing, vitamin water, Coca Cola, Kraft Peanut Butter, Haagen-Dazs Mint Chip Ice Cream, White Wonder bread and a couple more. It should always be in the back of your mind that too much sugar is going to hurt your body. We see way too many individuals that do not actually think about this. Vitamin Water is by far the best example presented in this video. While we all know about ice cream and soda, vitamin water is often a surprise. It is supposed to be water that has added vitamins so it should be good for us, right? In many cases the answer would be NO. This is due to the high added sugar. Take a look at the sugar infographic that is written below and you will quickly realize some of the foods that you most likely do want to avoid. Obviously, many others can be mentioned. Be sure that you are aware of how much sugar you put in your body. Do not abuse this.